You can’t be a true Filipino if you don’t sing karaoke. Pinoys and Pinays take their singing seriously to the extent that people have even been murdered for butchering Frank Sinatra’s “My Way” in their local establishments. 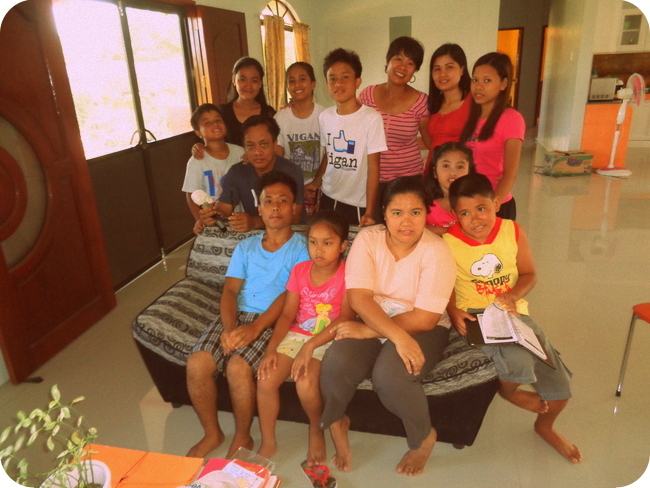 We don’t get that extreme when friends and family gather at our new home in the Philippines but we do get loud. 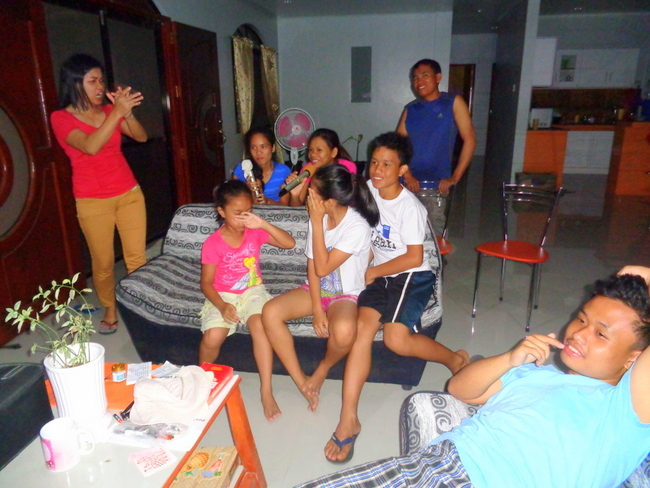 And when our eight relatives from Manila that recently visited us joined in for a Magic Sing session at our Karaoke Korner, seen below, the roof almost blew off of our new home in the Philippines. We have a separate 40-inch Samsung flat screen television mounted on the wall which is solely dedicated to karaoke. Here’s a look at the Manila Mob and our relatives from Guimaras, the island province that we call home, who all participated in our karaoke jam session which lasted around six hours. I sung my usual standards early on, “Paint it Black” by the Stones and “I Started a Joke” by the Bee Gees. 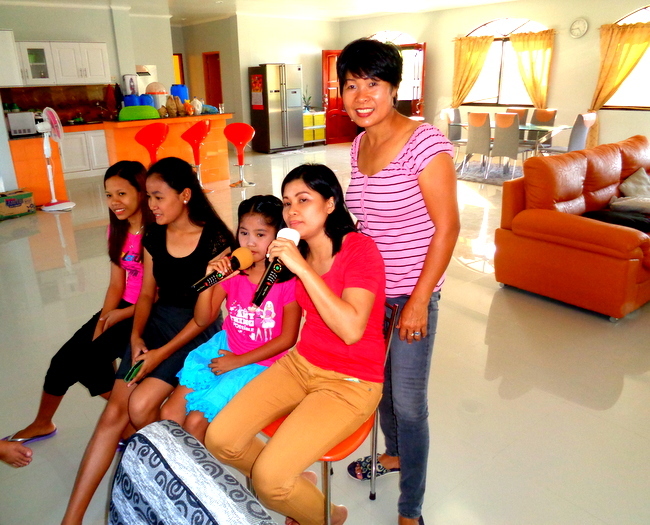 The female rockers in our group, seen below, are my sister-in-law Alida on the left, Mera, our helper, and relative in the back, with JalAmiel and my lovely asawa in the front. 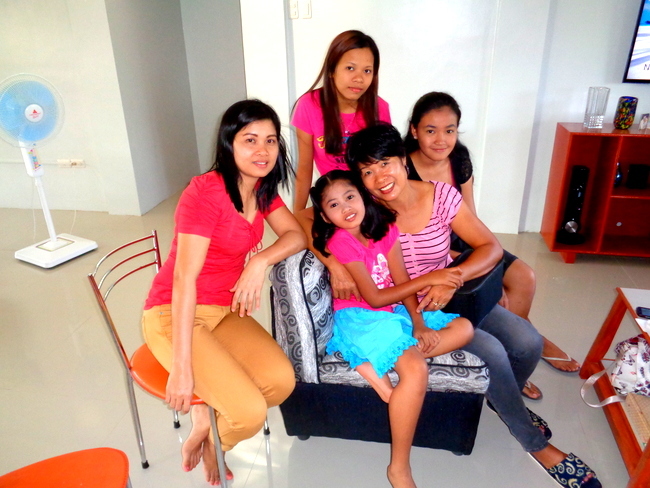 Niece DenDen is seated to the right of my wife. JalAmiel and her brother Jorreale can watch the same movie over and over. They must have seen “Guardians of the Galaxy” and “Scooby-Doo 2: Monsters Unleashed” at least three or four times each during their recent stay with us. 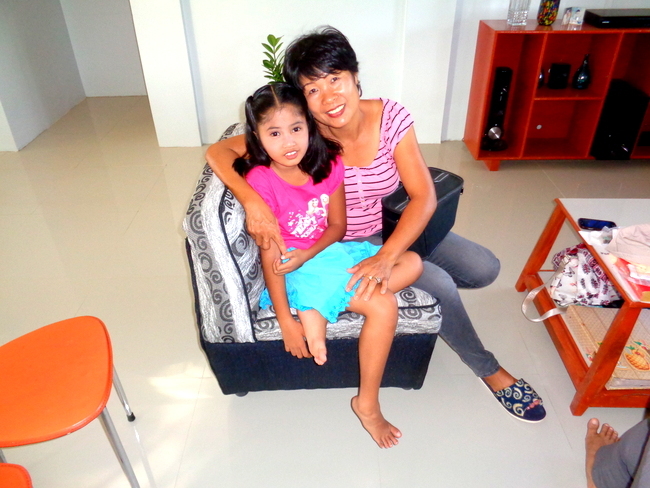 JalAmiel and her “Tita Daday” are very close. We always enjoy it when they come to visit us. Their papa, Joery, is the mainstay on our construction crew and has been working on various projects at our new domicile since November 2014. Joery’s current busy finishing up construction on the pump room for our new pool in the Philippines. Here’s another look at the ladies with a view of our 1,700 sq. ft. living room/dining area in the background. My wife wanted a huge space for entertaining visitors and she got it. 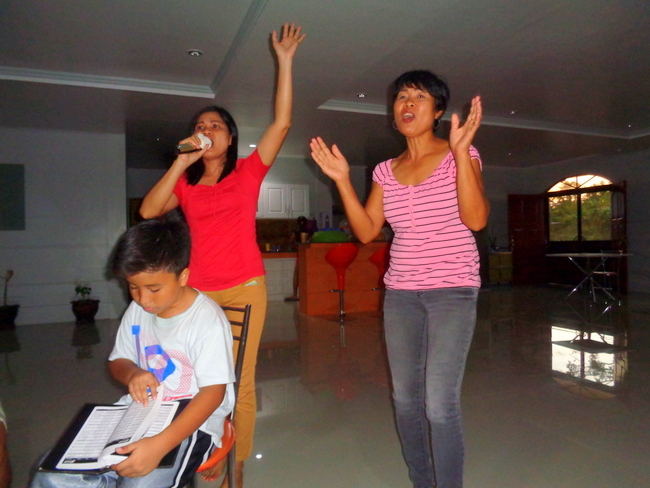 JalAmiel and her Mama, Alida, join in a spirited duet. Sister DenDen is busy checking her text messages as any self-respecting teen girl in the Philippines would be doing. My wife pulls out all the stops for “Zombie” by the Cranberries, the favorite song of her late friend, Melody, who passed away at the age of 36 while dancing with my wife. I’ll never forget that night my spouse called me and told me her friend had collapsed on the dance floor at my wife’s feet. Doctors at a Filipino-American function in Peoria where they were attending tried to revive the fallen Filipina but to no avail. Melody died that night. She had a pacemaker implanted years before after complications when she gave birth to her son. It was a sad day in our household back in the States. Melody was a good friend. Things got a little raucous after I went to bed and tried to sleep. Alida was growling out a tune with husband Joery in the background looking on. Did I mention that I got very little shuteye that evening? Hallelujah, thank you, Jesus. I missed the gospel sing later in the evening but having attended an independent Pentecostal Church for years, I’ve been to my fair share of worship meetings. 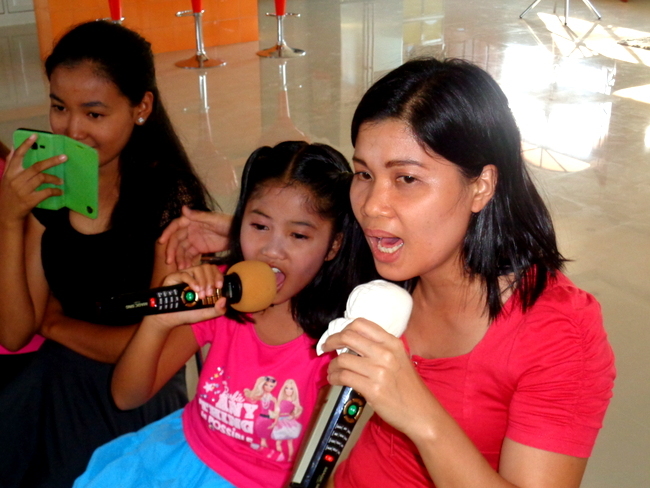 Really, Brothers and Sisters, you can’t be a TRUE Filipino if you don’t sing karaoke. Take it from someone who’s been married to a beautiful Filipina for over 16 years. Lol I can relate to that..spacious home you got there dave,hope you surpass the heatwave sir. Good to hear from you, Pantera. We’re off to Cebu today for a week’s vacation. You can bet that our rooms will have a good air con. April and May are always the hardest months for me to endure, due to the heat and humidity, but I’ll make it. Sorry to hear about your wife’s friend taking way to early you never know what’s round the corner, best to enjoy life now Derek in pasig. A very hot Manila. Yes, Melody was a great friend who my wife sorely misses. We love karaoke unless it’s in the early morning hours when we are trying to sleep and the person can’t carry a tune. This usually happens from someone a mile away. Melinda had a Filipino acquaintance back in the States, Papa Duck, who couldn’t carry a tune if her life depended on it. 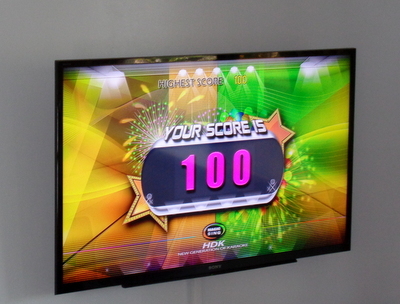 She sang loud and followed the lyrics and always scored a “100” on the Magic Sing. She eventually got deported back to the Philippines though her deportation had nothing to do with her lack of singing skills. 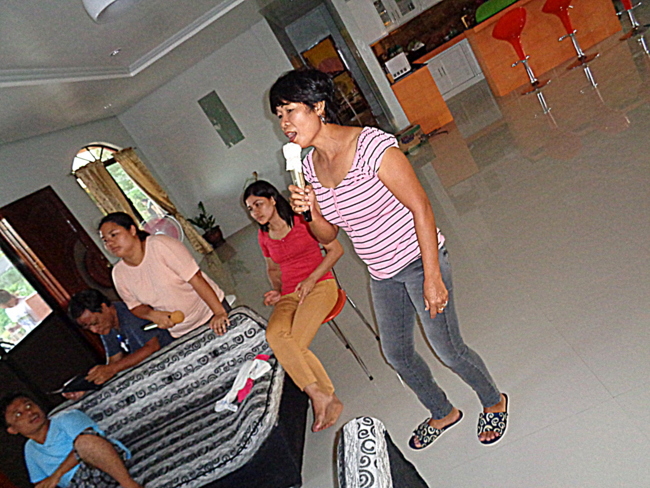 We have more then are share of karaoke at are house. I believe my sister-n-law has the biggest set of speakers in town and wants to make sure the whole town knows when we are doing karaoke. We can’t even get a day at the beach without some karaoke. We had numerous karaoke parties back in the States, Roger. It’s great fun. I usually pass on the Tagalog songs but occasionally will “sing” one for everyone’s amusement and butcher all the words. Yes, plenty of karaoke machines at the beach. Some folks rent machines for parties but hopefully do not let the tv out in the rain like my brother-in-law did a few years ago. Dave, that big open concept kitchen/living room/dining area should also help with air circulation and keep the house a bit cooler, compared to having three separate smaller non-airconditioned rooms. Yes, that’s true, Lance. We get good cross-ventilation in the big space and in our master bedroom. In fact, we haven’t had to use the air con since we got back from Cebu. Dave after my workday (mostly on web design) I totally chilled by drinking a few cold ones while listening to the Grateful Dead on my iPad. Dawg I hope I’m not losing my island groove. Okay I did sing aloud on the live version of “Truckin” but only one neighbor complained. Rock on Guimaras! Ahhhh, now that looked like a great time! Things like this are why I love the Philippines so much. Get a karoke machine, some food, and some alcohol and the fun goes on and on. Looks like all had a great time…even if you did lose some sleep. Thanks for the kind remarks regarding the house, lots of projects are still ongoing on site, but we’re getting there.